Will Climate Policies Give Us Cleaner Air? We breathe air, but there’s more in it than just oxygen. Breathing in certain things can make you sick, which means you might have to miss school or work, go to the hospital, or have an asthma attack. Breathing dirty air can cause heart attacks and lung cancer, which, in some cases, can lead to death. Two of the main parts of air that make us sick are particulate matter and ozone. (Note: Ozone in the stratosphere, air very far overhead, is good for us because it can protect us from harmful UV rays, but when it is near the ground it is harmful to breathe in.) We use the term air quality to talk about how healthy the air is to breathe. Climate change is caused by other things in the atmosphere, called greenhouse gases. Often, pollutants that harm our health and change the climate come from the same place, such as from your car’s tailpipe. This means that if you reduce emissions from your car, there are benefits for the quality of the air and the climate. The climate itself can also change how healthy the air is for us. For instance, rain can help remove pollution from the air, so if rain patterns change, the quality of the air will change, too. Most countries in the world are trying to reduce how much of the climate impacting substances they release into the atmosphere by implementing climate policies. These policies have impacts on the breathability of the air as well. Pollutants move around the planet as the rest of the air moves around. Scientists use computers to simulate how climate policies impact what is in the air. As the world reduces greenhouse gas emissions, air quality changes as well. Scientists compare simulations of the future with and without climate policies to determine the benefit of the climate policies. 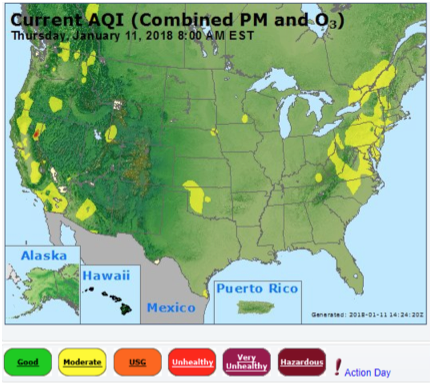 Other scientists, called epidemiologists, look at how many people get sick when there are different levels of particulate matter and ozone in the air. We can use that information to figure out how many people might go to the hospital or morgue for the different futures. Air quality should get better if we try to avoid climate change. Both particulate matter and ozone are expected to decrease in the future with climate policies in place to reduce greenhouse gases. We have already made some strides in improving air quality through regulations like the Clean Air Act and CAFE, which improves vehicle efficiency. Compared to the present, both futures (with and without climate policies) have fewer early (premature) deaths due to poor air quality, because there are already efforts to reduce emissions that are bad for our health. The future with policies has better air quality than the one without a climate policy. The biggest reason why air quality would improve is that fewer pollutants would be released to the air. More than 90% of the improvements in health are due to reductions in emissions (when releasing fewer greenhouse gases means that less of other pollutants reaches the air as well). The rest of the health benefits come from differences in the climate conditions (e.g., fewer extremely hot days or changes in wind patterns) that change how long pollution stays in the air and where it ends up. Most of the health benefits in the US come from actions taken by the US, but 15% of the benefits are attributed to actions taken outside of the country. Winds that blow pollution from other countries can impact the health of those living in the US. Emission reductions from residential or local sources have a particularly large impact on health, because air pollution produced near homes is more likely to be inhaled. The researchers calculated how much money the health benefits are worth, and found that the value is likely to be larger than the cost to achieve the reductions in greenhouse gas emissions in 2050. For instance, your new water heater might be slightly more expensive, but your insurance might be less. The results of the study do have uncertainties associated with them, making it difficult to determine the exact number of people likely to be impacted or precisely what the air quality will be in a particular city in the coming decades. However, even with these uncertainties, it is likely that if the global community reduces greenhouse gas emissions, air quality will improve and related deaths will be reduced in the US. Research that has been done in the past has looked at how greenhouse gas reduction could improve health, and this study found that global coordination of these efforts can increase the benefits. ← Can antibiotics impact the non-crop plants?